Tribe rings!! Get out, sista!! I think I hear one calling me. Oh man, save me one of those calendars. I'm positively MOONING over that bunny. Love the stories these calendar paintings hold. Can I be in your tribe? So longing for a tribe ring from you! Can't wait to see them ... soon, soon? *sigh* lovely lovely, cannot wait to hear more :). just when I think it can not get any better IT DOES!!!!! EEE! These rings are amazing! Hoping these come in larger sizes, for us girls who have bigger fingers. (hint, hint) The calendar just keeps getting more amazing, which I didn't think was possible. So much beauty all around! I love that YOU loves some hares! 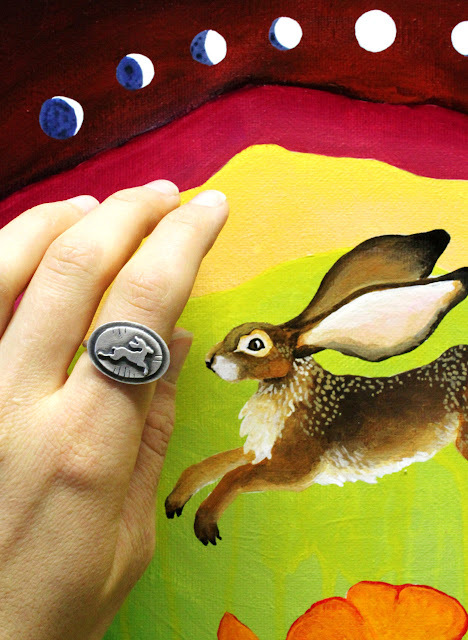 Hollie - this particular jackrabbit is a true US size 9.75, and I'm making a concentrated effort to offer a whole range of sizes in this series! Thank you! After breaking my hand and almost all my fingers a few years ago, I cannot wear my normal old size. Makes it difficult to find rings that fit.